This remarkable novel, first published to a chorus of acclaim in 1952, is one of the lost classics of Australian literature. Martin Boyd is a deeply humane novelist, a writer of family sagas without peer. 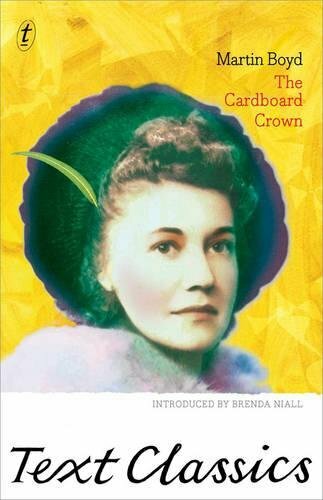 Set in Australia and England in the late nineteenth and early twentieth century, The Cardboard Crown presents an unforgettable portrait of an upper middle-class family who love both countries but are not quite at home in either. At the centre of this scintillating and immensely readable novel is Alice Verso, whose unexpected marriage to Austin Langton not only brings financial stability to the Langtons but founds an Anglo-Australian dynasty. But when her grandson finds her diaries and begins to uncover her story he chances on an intricate web of deception and reveals the complex fate of his family over three generations. Features an introduction by one of Australia's best-known and award-winning biographers, Brenda Niall. One of the texts we had to read in English when I was in Year 12 (final year of high school) was A Difficult Young Man by Martin Boyd. I was so taken by that book that I just had to read the others in the Langton Quartet - the others books we had to read included DH Lawrence's Sons and Lovers, which I did not enjoy at all. The Cardboard Crown explained so much of the background of the family, and even though it is many years later, the series of novels remain as my favourite Australian literature. It is possible that as we had travelled so much when I was younger that I could relate to the family's restlessness, and not feeling at home in one particular place. Sourced from Better World Books as a Christmas RABCK - hope you enjoy this as much as I did! This one sounds really good, I just love it when you pass on one of your favourite Australian authors, I do know I'm in for a treat. I have just finished the book, and I am in two minds about it. I did enjoy the family history and secrets which unfolded as I read, however, I did not really take to any of the characters - in my opinion they were an unlikable bunch! Quite often I struggle with books where I do not really like any of the characters. Anyways, it was an interesting read - and it will move on fairly soon. I've got plans for it. My September book is coming your way. Enjoy! Thank you too for the postcard. I looked for Hans-Olov Öberg on Qwant.